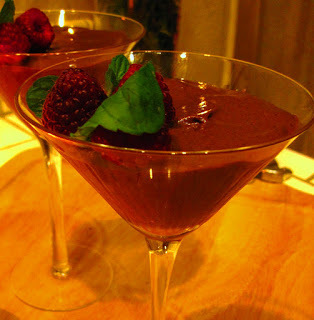 Valentines’ Day can be celebrated more often than once a year with this modified healthier version of chocolate mousse. Let’s face it, we all like to have a splurge now and then — at least I do — and feeling better about it … well, that makes it all the more fun. Chocolate Mousse is usually laden with fats, cream, and all the YUCK stuff we are trying to avoid when eating clean, even chocolate in moderation. So, I came up with this recipe to eliminate the bad fats and add some good ones. The keys to this recipe are using extra dark chocolate chips for more antioxidants and using the fabulous avocado for healthy fats. And guess what? The mystery in this wonderful dessert is that you are unable to taste the avocado! It provides the creamy goodness in the mousse. Ready to WOW your sweetheart with a fabulous healthy dessert on Valentines’ Day or anytime? Let’s head to the kitchen, grab some fancy glasses, and whip up some Chocolate Avocado Mousse. Melt the chocolate with the chili powder in a double boiler over hot water and set aside. While the chocolate is melting, place the egg whites in a stand mixer and whip until light peaks form (you can also hand whisk but be prepared for an arm workout). Place the ripe avocado, agave nectar, pudding, milk, and melted chocolate into blender and blend until creamy. Spoon out the chocolate mixture and add to the egg whites. Whip again until light (this will not take long). Divide the mousse between 2 martini or wine glasses, cover with plastic wrap and place in the refrigerator for at least one hour. When ready to serve, pinch a few mint leaves and stick into the mousse and select beautiful raspberries to compliment the leaves. I used 3 berries per glass. The presentation will not disappoint on your special day. Enjoy!